The digital age has brought about changes throughout many aspects of our personal and professional lives. We’ve seen the use of quill & parchment give way to the typewriter, and then to the word processor, and ultimately to the modern PC. We’ve also seen slide rules become simple calculators, and then more sophisticated calculators, and now much math is also done on modern PC’s. Of course there is still the old tried-&-true just do it in your head method, but I think we all know how most artists feel about that. ( I mean personally, if you gave me a piece of paper and a pen and asked me to do long division, well, it would probably end with me sitting in a dark corner talking to the voices in my head. ) And speaking of artists, the modern digital artist is a perfect example of the transition of the technology revolution. Most art professionals today have given up the classic media in favor of the wonderful variety of modern digital tools. Now there are those who argue that the shift away from the classic tools, and toward a digital medium, will be the eventual demise of the artistic community. Some will agree with this statement, and others will not. Now I don’t want to devalue those ideas at all, but my own personal opinion, and again, this is just my opinion, is that the tools we use to create, are just that, tools, and a vehicle to deliver our own artistic expression. ( I have used a variety of the classic medium, oils, acrylics, charcoal, albeit, a very VERY long time ago, and I will be the first to admit, I don’t know how I ever survived without my undo command! Maybe it’s just the overly indecisive side of my personality finally enjoying life to the fullest. ) But enough semantics, let’s get to why we are really here! The tools of the modern digital artist can basically be broken down into 3 main categories. You’ve got your software, your input devices, and most importantly, the system on which these will run. Well today, we are going to look at the first of three professional graphics workstations from one of the most well known PC suppliers around, the Z400 workstation from HP. The Z400 is the entry-level model in HP’s workstation line-up, and I will admit, for an entry-level system, it’s a pretty fast little machine, and working on it for the last several weeks has been an overall pleasant experience. So to start off, I’ll give a breakdown on how the system is configured. First, we’ve got an Intel Xeon W3520 processor running at 2.66GH. This is one of the new Xeon server chips based on Intel’s new Nehalem architecture, also known as Core i7 in the desktop market. In fact, the new Xeon and the Core i7 processors are very similar, the Xeon’s just being slightly different hardware wise, with a few optimizations over their desktop counter-parts such as the ability to support ECC memory, providing increased system reliability, as well as Direct Cache Access for enhanced network performance. The 3520 CPU runs on a custom designed X58 chipset motherboard. Also in this system is 6GB of DDR3 memory, a 160GB system hard drive, a 500GB data drive, and an NVIDIA Quadro FX1800 video card. And for the OS, we are using Windows XP professional 64 bit edition. I have personally found that while most games and applications run just fine under Windows Vista, most CAD & DCC apps perform considerably worse in Microsoft’s newer OS that they do in XP. Now this may change with Windows 7, but I have not yet had the opportunity to do extensive testing with Win 7, so for the time being, I choose to stick with Microsoft’s older, yet tried-and-true OS. And finally, displaying all of this processing power, we have one of HP’s beautiful 30 inch performance display’s, the HP LP3065 running a desktop resolution of 2560 x 1600. The case design is simple yet attractive, with the silver case giving way to a nicely designed black front panel. Rear panel connectivity, is a bit on the low side, but not horribly so. There are 6 USB 2.0 connectors, 1 Ethernet port, audio jacks, and legacy PS2 mouse and keyboard ports. Fire Wire, both 1394a & 1394b versions, as well as ESATA are optional, but were not included in the test system provided. The front panel houses 2 USB 2.0 ports, an audio line in & line out, and 1 Fire Wire port. One interesting note, is that while there is the main power button, there is no reset button. Perhaps it was viewed as extraneous by HP, but I personally like having a reset button, and although it is not a huge issue, I find it curious that it was left off. Opening the side panel of the case reveals a clean and well thought out interior. What is really nice is that this does not require the use of a screwdriver. In fact, all of HP’s Z series workstations are 100% tooless designs. Everything comes apart with the release of various clamps & levers, so no tools at all are needed to work on them. This is one of my favorite aspects of these systems. All of the power lines are tied together so they do not obstruct airflow through the system, the CPU is cooled by a rather large heatpipe tower cooler, and my personal favorite, are the hard drive bays, which put the hard drives in a transversely mounted position at the front lower part of the case. This is nice because it puts the hard drives in a position so that they can slide out the side of the case making it much easier to remove without things like the video cards and memory modules getting in the way. You can see in the photograph of the system’s internals, the various green tabs scattered thought the system. These are the tooless release tabs. Just a few clicks and snaps, and you can remove most of the internal parts of the system. In fact, the only parts that require tools to remove are the CPU cooler, and the motherboard. 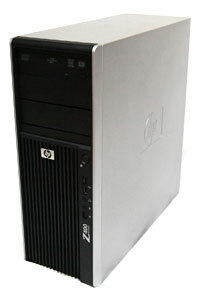 The overall build quality of the HP Z series systems ranges from very good – excellent, with the Z400 being in the very good range. Now this initial review is about the Z400, but in upcoming articles, you’ll get to see the Z600 & the Z800 workstations, and it is in these systems that the build quality is very impressive. Now don’t get me wrong here, the Z00 is a great system, and I believe that it does stand above comparative systems from other vendors, however, when you compare it to the other two models in it’s own line-up, it seems rather ordinary. In fact, I have very few complaints about this system, but one of the ones I do have is that it would have been nice if HP would have given the extreme-high quality modular case designs of the Z600 and Z800 to their entry level system as well, as they are quite impressive as you’ll get to see in the up-coming reviews. Now one of the nicest features of the Z400 is the noise level it generates. Unfortunately I do not have the equipment needed to measure actual decibel levels, but I will say that this thing is nearly silent! ( In fact, my wife went to turn it on one day, and after pressing the power button, she didn’t think it had actually turned on it was so quiet! ) The CPU fan, case fans, the Quadro 1800 fan, and the hard drives are almost completely silent which is quite nice compared to pretty much all the systems I have used in the past. Now there is one drawback to this pleasantly quiet operation, and that is the fact that the low fan speed on the CPU cooler causes it to run a bit on the hot side. Doing render tests, under peak load, the CPU core were topping out at 71 degrees C which is a bit on the hot side. 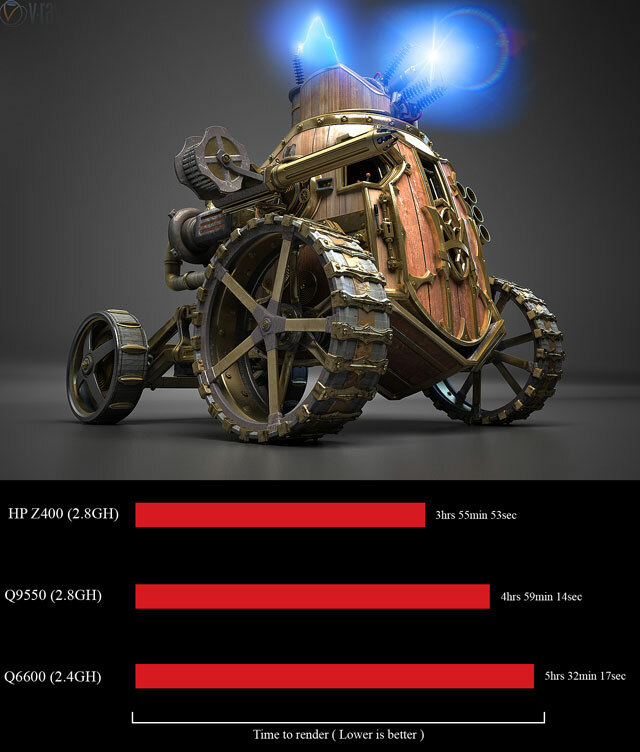 A small suggestion to HP would be to have the fan speed increase under heavy CPU load, or at least give the user the ability to control fan speed manually. This thing is so quiet that I’m sure most users probably wouldn’t mind a small amount of noise when the CPU is under heavy load to keep temperatures in check. On the flip side of that, HP will start offering liquid cooling solutions to their Z series workstations in August which promise to keep the silent operation but provide greatly increased cooling capacity. The only drawback to this is that it will be a more expensive option than the air cooling solution. HP claims to be a leader in green technology. All of the systems in their new Z series workstation line-up conform to the latest Energy Star V5 specifications. On top of this, all of the Z series systems have 85% or higher efficient power supplies, and are made up of over 90% recycled materials. Going green, and reducing our carbon footprint seems to be a big part of HP’s current business model, and whether or not they are doing this for sincere reasons, or to simply push their image, the fact that they are doing it at all is commendable. Now let’s get to the meat of the review, testing and benchmarks. Now there are a lot of appropriate programs out there to benchmark a system such as this, however, limited time and availability of assets forces me to limit testing to the more popular packages. Today we will be examining test results in the following applications: 3ds Max 2010 / MAYA 2009 / Softimage 7.5 / Zbrush 3.1 / Mudbox 2009 / Mental Ray rendering system / Brazil rendering system / Vray rendering system / Maxwell rendering system / Adobe Photoshop CS4 / Adobe After FX CS4 / Adobe Premier Pro CS4. For future system reviews, if there are any applications that you, our readers, would love to see tested, please feel free to log into our forums and request them. Now no performance comparison would be complete without a 2nd system to compare the newer one to, so our control system is my previous work system based on Intel’s previous generation Core 2 Quad CPU’s. It’s specs are as follows: Core 2 Quad Q9550, Q6600 / Nvidia 780i motherboard / 8GB DDR2-800 memory / WD 150GB 10,000 RPM raptor HD, and a 1TB data drive / Nvidia 8800GT Video Card, and an Nvidia GTX260 Video card. 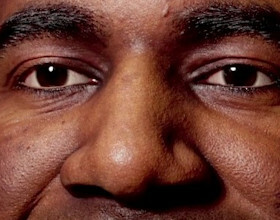 ( I run the GTX 260 with the Q9550, and the 8800GT with the Q6600. ) And again, all of this is running Windows XP Pro 64 bit edition. I also recently received a Core2 Quad Q8400 CPU from Intel, and after some testing, I found that this chip runs at almost identical performance numbers as the Q6600, just in a cooler, slightly less power hungry package due to it’s 45nm construction versus the Q6600’s 65nm construction, so for simplicity sake I chose to just reference the Q6600 in this article, but you can look at it as performance numbers for the Q8400 as well, wich all-in-all, is a pretty good little chip for it’s price seeing how it performs pretty decently, runs very cool, and has a low power draw. We will look at this more in a future article, but for now, back to the Z400 benchmarks! Here we have a 1.5 million polygon of the SDF-1 ship from the 1980's animated television show, ROBOTECH. 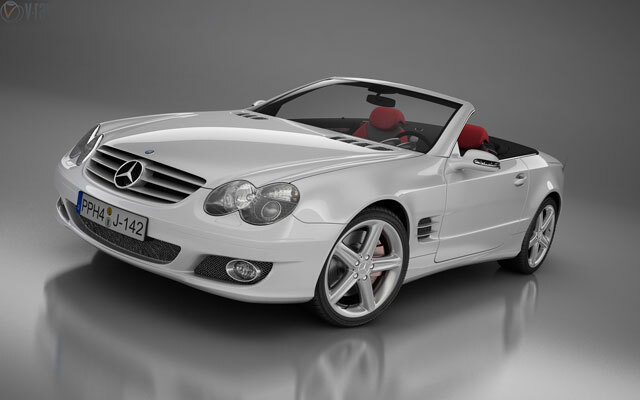 This model is rendered with the Brazil 2 rendering system. 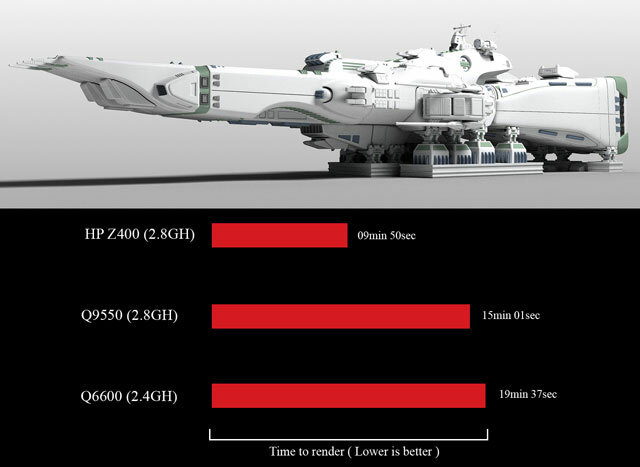 As with the two Vray scenes, rendering performance wins with the Z400, followed by the Q9550, and last with the Q6600. 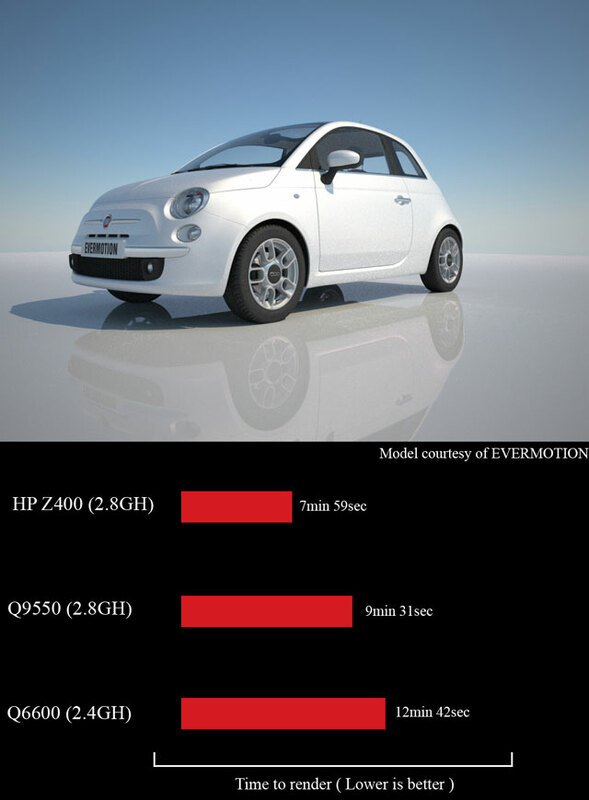 Finally we've got a model of a Fiat 500, also provided by Evermotion, rendered with Next Limit's Maxwell Renderer. No surprise so see similar results as all the other renderers. Here we have the same tank model rendered with Vray 1.5 SP3. Now we really see the power of the Nehelem chip surge ahead of the Core2 Quad systems. Next we have an architectural scene provided by Evermotion also rendered with Vray 1.5 SP3. Again, the Z400 shows a commanding lead in performance over the Q9550 and the Q6600. First we will look at performance with Autodesk’s 3ds Max, and several popular rendering packages. Using Max on this system is a very nice experience. Max’s overall performance in object manipulation, and editing is quite fast. It’s difficult to put actual percentage numbers on the overall speed of using the program, but just looking at some basic tests, I would say that overall, the program as a whole runs somewhere around 15% faster on the Z400 than the Q9550, and another 5% or so over the Q6600. Not bad considering the Q9550’s clock frequency is higher than that of the W3520. ( 2.83GH vs. 2.66GH ) There is one caveat though, the Z400’s video card, the Quadro FX1800 seems to have some difficulty displaying high levels of geometry in the viewports at resolutions of 1900 x 1200, and 2560 x 1600. ( the resolution our HP LP3065 runs at ) It is here, and all of our benchmarks that are video card dependant, where the Core 2 Quad system shot well past the Z400 in performance. It make a bit of sense considering that the FX1800 is on the lower end of Nvidia’s Quadro line-up, it’s just a bit unfortunate seeing that the non-professional desktop cards, the 8800GT and GTX260, surpass the FX1800’s performance by a significant margin. On average, the GTX260 & the 8800GT led the FX1800 by about 40% and 15%, and since 3ds Max has a native direct 3D mode, the desktop card’s stability is just as good as the professional Quadro card. Now where the Z400 system really leaps ahead of the older Core2 Quad system, is in rendering performance. On average, we see a 26% performance increase over the Q9550, and a 40% increase in performance over the Q6600. It is here that the new Nehelem architecture really shows what it can do, and for all of you render buffs out there, this is a very welcome benefit as we are always looking for ways to lower our render times by significant margins! 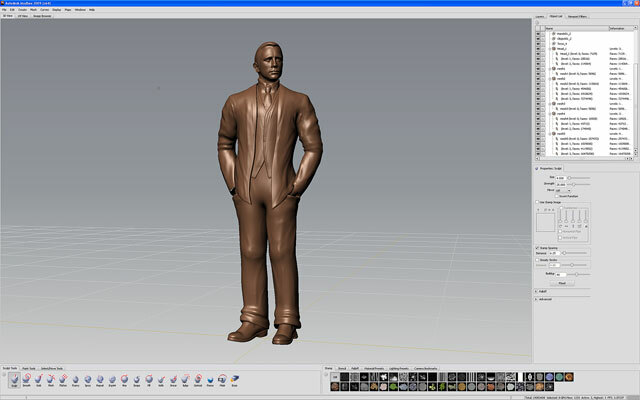 Next we have Autodesk MAYA and Softimage, as well as rendering with Mental Ray. 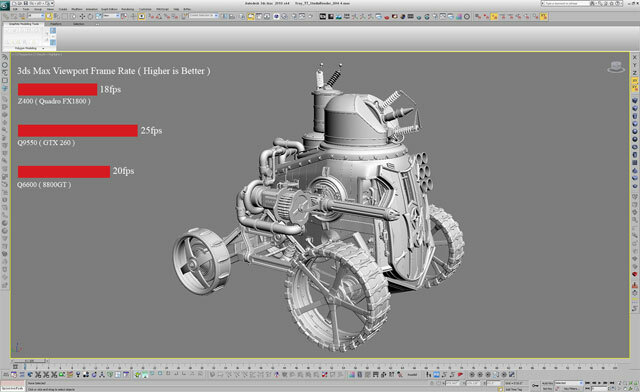 Like Max, Maya also runs quite well on this system, averaging similar 10% – 15% increases over the 2 Core2 Quad systems. Also like the 3ds Max tests, the Quadro FX1800 does seem to be the one bottleneck when it comes to application performance in MAYA. There are a couple of interesting results in the MAYA tests though. First we have a MAYA cloth simulation. It’s just a simple flag waving in the wind, but it yielded some curious results. First of all, the cloth simulator does not appear to be multi-threaded, as running the simulation, only ever stressed 1 of the CPU cores, and after running the simulation on the Z400, and the 2 control configurations, we find that the Q9550 beats out the Z400’s Xeon chip by a small margin, with the Q6600 trailing last. This is odd considering the Nehelem chip’s superior floating point performance, and since the geometry in this scene isn’t especially heavy, the FX1800’s performance shouldn’t come into play here. These are some odd numbers that I shall have to look into deeper in upcoming tests. The other noteworthy test done in MAYA, is an animated character deformation test. Deformations are a good test of a DCC workstation as they stress both the system’s CPU, performing the deformation calculations, and the system’s video card, as it tries to display all that geometry fluidly as you scrub through the animation timeline. Here the Quadro FX1800 again is the system bottleneck, but offsetting that quite a bit is the powerful W3520 CPU. The Z400 still comes in last in this test, but by a much smaller margin that the other viewport performance tests. 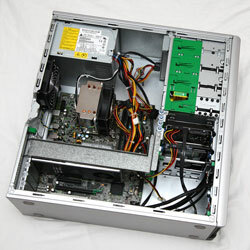 This furthur illustrates the point that pared with a more powerful video card, this can be a truly formidable system. Also here we have Autodesk’s Softimage. Now the interesting thing about Softimage, is that it is very fast compared to Max & MAYA. Overall object editing and manipulation seem to be nearly identical performance wise on all 3 systems, with the Q6600 showing only a slight decrease in horsepower. There is a more discernable difference in viewport frame rates between them, but all 3 are fast enough that the difference doesn’t really matter. Rendering with Mental Ray yields similar results to the previous render tests with the Z400 showing an strong 65% lead over the Q9550, and an astonishing 117% increase over the Q6600. With digital sculpting becoming all-the-rage these days, I just had to benchmark 2 very popular sculpting programs in today’s DCC arena, Pixologic’s Zbrush, and Autodesk’s Mudbox. These 2 programs both are used to achieve similar results, but they go about it in slightly different ways which affects their performance on our different test systems. Zbrush is a heavily CPU bound application, hence it performs quite well on the Z400 system with it’s powerful Xeon W3520 CPU. With the test model, I was able to push the model’s polygon count up to about 33 million before both editing and viewport performance started to degrade, and at just over 60 million, performance degraded enough that I found myself stepping back down to keep working. By comparison, the Q9550 system hit similar walls at 28 million, and 47 million. Now Mudbox does things a little different, unlike Zbrush, Mudbox is more video card dependent, and once again, the FX1800 becomes our bottleneck. Now since the actual editing of the geometry is powered by the CPU, sculpting remains pretty smooth and fluid all the way up to the video card’s limits, but at 24 million polygons, the viewport performance ground to a halt, and I found myself isolating groups of polygons in order to keep working. Again by comparison, the Q9550 running the GTX260 video card was able to hit 38 million before major slow-down kicked in, and the Q6600 with the 8800GT was able to achieve close to 30 million.